Food Gamut - New spectrum of Food: Cheesy & Chat Pata Bread Pakodas. Cheesy & Chat Pata Bread Pakodas. In a large bowl mix together gram flour, salt, hing, ajwain and water and mix well to form have a batter consistency. Take Slice of Bread. cut it into triangle shape. green chilly + Curd + Salt + Cumin Seeds + Garlic Cloves ). Take another slice apply tomato hot and sweet catch up. Put cheese slice between two slices and press it make like sandwich. 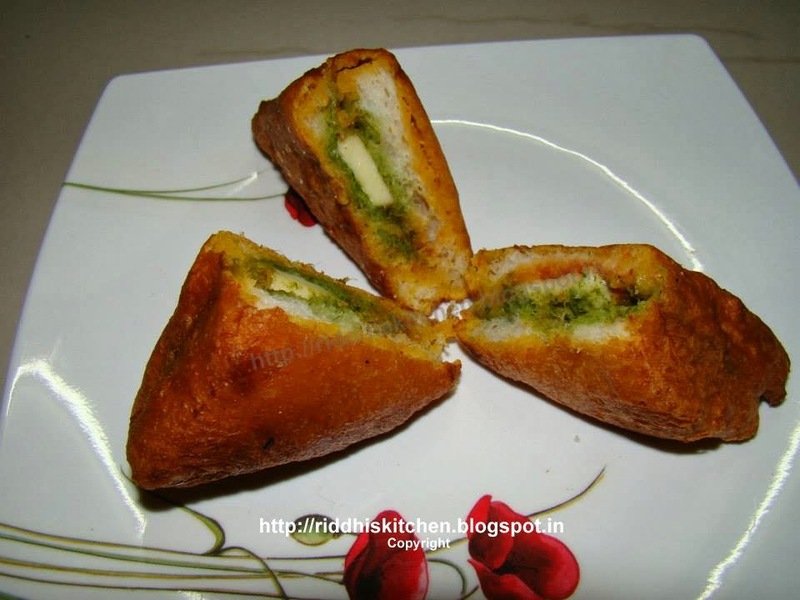 Dip this sandwich in the gram flour mixture, deep fry them till golden brown in color.